2. Wash the mackerel and pat dry with kitchen paper. to coat, pressing on to both sides. watercress and boiled new potatoes. Serve Chateau Caraguilhes Rose 2009 Corbieres, South of France, £9.99/75cl. 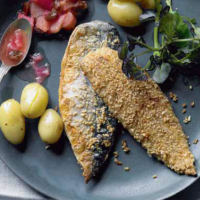 This tasty pairing needs a gutsy wine to slice through oily mackerel while simultaneously reining in the tartness of the chuntney.